Although PC-based flight simulations have been available for 30 years, many pilots, instructors, and flight schools don't understand how best to use these tools in real-world flight training and pilot proficiency programs. This invaluable reference bridges the gap between simulation tools and real-world situations by presenting hands-on, scenario-based exercises and training tips for the private pilot certificate and instrument rating. 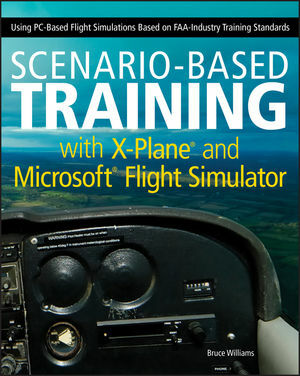 As the first of its kind based on FAA-Industry Training Standards (FITS), this book steers its focus on a scenario-based curriculum that emphasizes real-world situations. Experienced pilot and author Bruce Williams ultimately aims to engage the pilot, reinforce the "realistic" selling point of PC-based flight simulations, while also complementing the FAA-approved FITS syllabi. You'll take off towards pilot certification with this invaluable book by your side. Bruce Williams owns BruceAir, LLC, an aviation consulting, training, and pilot services company. A certified flight instructor and FAASTeam representative, he has been a pilot since the early 1970s. During his 15-year career at Microsoft, he worked on six versions of Microsoft Flight Simulator. The zip file containing the charts can be found at 9781118105023_Charts.zip. The zip file containing Web Content can be found at 9781118105023_WebContent.zip. There are two sets of files that contain PDF versions of charts that complement the scenarios: 9781118105023_Charts.zip includes both VFR and IFR en route charts (sectionals, WACs, and low-altitude IFR charts) IFR_Charts.zip includes IFR approach and departure charts for the instrument flying scenarios You can find free versions of the latest versions of all of the charts at SkyVector.com. Changes in X-Plane Situation File Formats and X-Plane 10 The developers of X-Plane often change the format of the Situation files that save initial conditions for specific virtual flights in X-Plane. Given the frequency of updates to X-Plane, it?s impossible to provide Situations for each release of that simulation, and the X-Plane Situations available for download from the book?s page at Wiley will not load in X-Plane 10, which was released long after the book went to press. They also may not work with some releases of X-Plane 9. As noted in Chapter 10, ?Using the Scenarios in This Book,? the Situations just set the initial conditions for a scenario (aircraft type, location, weather, etc. ); they?re not scenarios themselves or interactive ?missions? (see especially p. 109?110). The scenarios in the book are in effect the lesson plans, and if you can?t load the X-Plane Situation files provided to complement the scenarios in the book, you can use the description of each lesson to quickly set up the Cessna (or your choice of aircraft) at the location where a particular virtual flight begins. For more information about X-Plane and Situations, see Chapter 6, ?A Quick Guide to X-Plane,? and the help resources described there.